The first tablet for PC gamers Razer Edge Pro reveals its real power! The history of technology is much more interesting and enjoyable thing than anyone can think. Speaking about computers, for the 36 years since the first PC in 1977, mankind has reached the technology, when the tablet can replace not only the console console, but also the PC! Two weeks ago, the world has come a revolutionary device - Razer Edge Pro! The uniqueness of this tablet is that it almost replaces the home computer. Razer Edge became the basis for Windows 8 and x86 architecture , which allows you to run any Windows-compatible software. In principle, this is the next step notebook-transformer, capable of separating the screen from the keyboard. 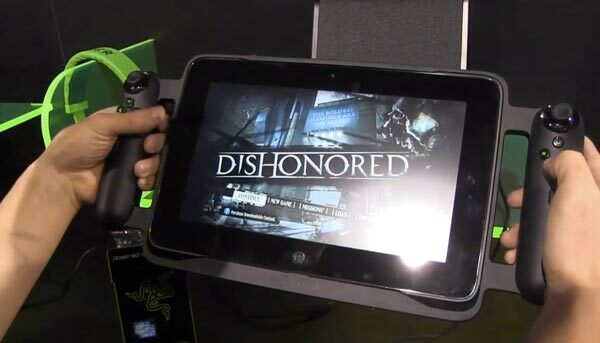 For example, a representative of the developer starts Dishonored with Steam!!! Response not only pleases the eye but all the other senses, erasing the myth that "the tablet needs to throw birds at pigs." In addition to the standard form of Razer Edge Pro connected by choice or platform-joysticks with handles on each side, or stand with USB, HDMI and Audio output, allowing you to connect 2 joystick and a TV and use it as the Xbox 360 or PS3. More detailed specifications you can read below to see if you are ready to shell out from 1000 to 1300 dollars for the "first tablet for PC gamers"